A New Life in Wales: Dare to show my face? 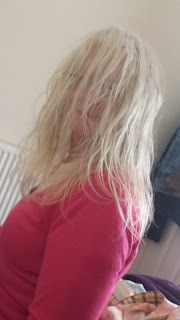 In a response to Kev at An English Homestead, yes of course I will show my face, just as soon as I have tamed this just showered mop. He did say that silly selfies were welcome, I am debating whether to get it chopped off. The thing is that when I cook I like my hair scraped up, a stray hair in food is so yukky. If I get it cut I either need it long enough to tie up or so short that it does not matter. mmmm, I am not sure that I am ready for such a dramatic change. Anyhow, to relax my mind, if not my body, I have started sewing scraps again. After my last foray into the scrap bins I threw a load of mismatched bits and strips into a linen basket. Today I tipped it out and started picking through it. There are lots of oddments in here but I can not bring myself to waste them. The first pick, pressed and ready to start sewing into pairs. These pairs are pressed and ready to be paired again. It is a tedious process to begin with but soon grows on me. Some of these small blocks have 8 or 9 smaller bits stitched together. All the blocks need tidying up every now and then, once I have a good stack I will straighten up the edges then sew each to a strip. Then start again until most of the scraps are used. Finally I will get all the blocks sewn together, some will need cutting again but most of the "new fabric" will be used. I have all the scraps from yesterdays quilt in a box. I want to use the old up first. I can not say that I am loving this but I need some brainless activity. Oh yes I could clean the oven or scrub the kitchen floor with a toothbrush but I will pass on those for now. I had a nice surprise in the post today, 6 packets of seeds from my garden magazine, some of these will be saved to next year but I will be sowing some next week. What do you think of my new ironing board cover, beneath the seeds, pretty, well padded and under £4 from Poundstretcher, I could not make one for that. I have had 2 quilts on the frame and FMQ'd with the 1600P. one has gone to a new home and this one will be staying with me. The stitching is a bit hit and miss but I expected it to be much worse. I will be loading another practice quilt tomorrow and will be quilting it on Monday. BTW the sofa throw is one of the first that I made, it is repurposed curtains and backed with the curtains that I cut the sashing strips from. It cost me just under £5 including the thread and all came from the same CS. I am now going to settle down and watch NCIS and digest my dinner. A very frugal meal using a half price Pulled Beef joint from Lidl, home grown new potatoes and home made coleslaw. It was just what I fancied, cost around £2 and made 2 good meals and there is slaw in the fridge for another time. Glad you had your specs to hand. Do FM quilt or do you quilt by hand? The frame is great, I have used it to assemble and baste quilts to quilt on my cabinet and to hand quilt. It does eat up a third of my sewing room though. Now I am learning to quilt on it, I do have pantographs as well but am leaving those for a while. Pam you are a laugh, I thought your hair looked lovely. Always busy, so much sewing I don't know where you find the time to garden as well. Quite easy, I hardly need any sleep. Sometimes I am up and sewing at 4 am. Plus I have a strict routine for the house and stick to it. Mostly. That's how I look when I've washed my hair ! when it's dry I just lean forwards, grab it all and tie it on top - I had a 'messy bun' long before they were fashionable. I love your pieces of fabric, I can't bear to throw any away either. I hate throwing fabric away too but just don't have the time to do any sewing right now - though I did get the curtain lining material when we were lunching with middle daughter yesterday in Swansea. I'm waiting for a wet day WHEN I have finally finished the painting and tarting up here, so we can go back on the market.